← Could the moon have played a role in UK’s heat wave ? 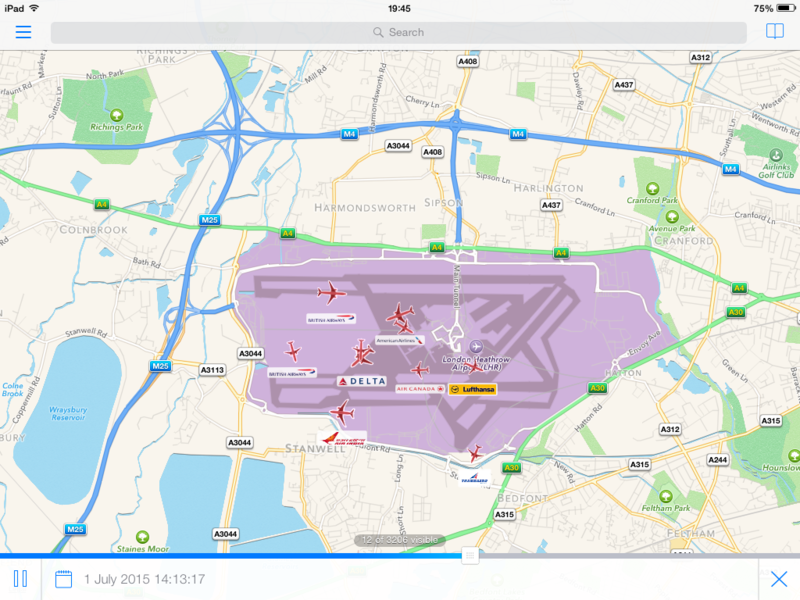 That Heathrow temperature record ? The record highest ever recorded July temperature by the Met Office at Heathrow Airport was given huge media coverage. The record was broken during one single heat spike that lasted just over 20 minutes between 14:06 and 14:30. What caused that heat spike? Mark McCarthy argues it was due to a break in clouds, and refutes Paul Homewood’s proposal that a change in wind direction sucked in hot Jet exhausts . However Mark doesn’t explain why a similar sun burst just 30 minutes later produced no temperature response whatsoever. He instead writes : “In this instance there is no compelling evidence to suggest the measurement is incorrect”. I disagree. There is compelling evidence that such a sharp temperature peak lasting just 20 minutes was actually caused by 3 long haul flights landing in quick succession, then exacerbated by the SE wind direction and late runway exits. The weather station is located on the northern border of Heathrow just beyond the North Runway. 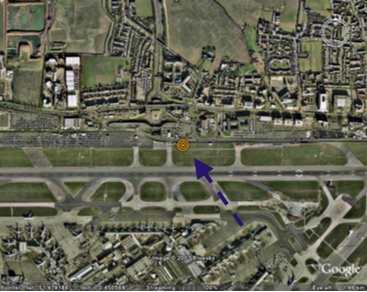 On July 1st the North runway was being used for landing aircraft arriving from the west because there was an increasing 4 m/s SE wind. This wind was also blowing directly up a major exit runway lane directly pointing towards the Met station. Location of the Met Office weather station at Heathrow is shown by the orange icon. The blue arrow shows the wind direction from the SE. superjumbo all landed within minutes of each other between ~ 14:00 and ~14:30 on July 1. Smaller aircraft normally exit well before they reach that exit, but large heavy aircraft need far more runway to stop. They must exit directly alongside the Met station, and as they turn SE towards the terminals their Jet engines accelerate thereby pumping hot exhausts directly towards the Stephensen screen. The wind directon on July 1 ensured that those hot gases reached the station. This, in my opinion, is a far more likely explanation for the sudden spike in temperature rather than any short sunny spell. Timings on plots shown below confirming this are approximate C/O Plane Finder on July 1. Heathrow is neither a registered WMO station nor is it is not one of the ~7300 stations included in CRUTEM4, NCDC GHCN V3 analysis. I am pretty well convinced that the Met Office made a mistake on this one. Did their zeal to find a record July temperature anywhere cloud their judgement? Heathrow was bound to be contentious because it is one of the world’s busiest and most compact airports. The ‘heat wave’ only lasted one single day so who really cares anyway? On balance I think Paul Homeward was more likely than not correct in his original analysis. 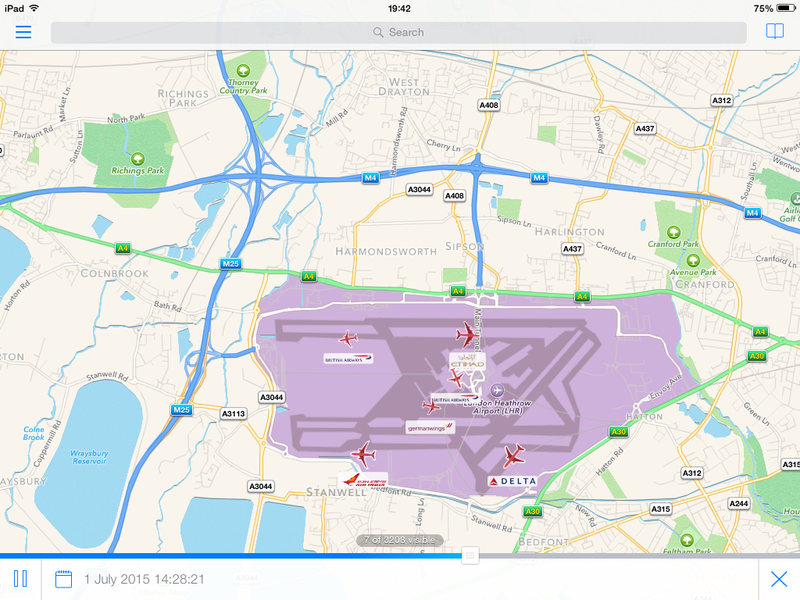 Correction: Heathrow is a WMO registered site and in CRUTEM4 ! This entry was posted in Meteorology, UK Met Office and tagged AGW. Bookmark the permalink. 43 Responses to That Heathrow temperature record ? Didn’t know Heathrow not counted as a registered WMO. Fascinating reading, cheers. It isn’t true. It is WMO 03772. You’re quite right ! Sorry that was a silly mistake. It is just not one of the 7300 sites used by NCDC. O/T Clive, but I’ve been trying to make another comment, and I invariably get a reply “Invalid Security Token”. I’ve done some research, and it seems that this is due to a Jetpack plugin at your end. Reinstalling it seems to fix. I tried removing the html for degrees, and it worked. Odd. I am at my cottage in Perthshire, it is late July and we just walked our dogs about 21:00. My wife had hat and gloves on. We have the wood burner on. The outside temperature is 11?C. Why is the MET office not reporting on this? The broader question is why did England have a heat wave? Was this because CO2 increased the surface air temperature at Heathrow? Off course not. It is because the sub polar jet is becoming increasingly meandering. This can either draw anomalous cold air southwards from the Arctic or anomalous warm air northwards from the tropics as was the case for England a few weeks ago. As for the MET office making a big deal out of that T spike at Heathrow, if indeed they did so, I didn’t consider this story worth any time at all following. Any scientist observing a spike like you show recorded at an extraordinary site like Heathrow would simply discount it as an outlier and should be at pains to explain so in the media. If the MET office have not done this then this is proof positive that they are not scientific. I agree completely. There seems to be a need for warming storylines to gain public support ahead of the Paris meeting. This was just a one day UK heatwave of little significance. I wonder if anyone at the Met Office remembers 1976. We had 2 months of hot sunshine without any rainfall. Temperaures were above 30C every day for nearly a month. The drought was so bad that Cornish houses were asked to flush the toilet only once a day ! That was what I call a real heatwave! Everyone was delighted. I have been in Liguria for the past 3 weeks. The temperature is hot and sunny and has reached 34 to 36C every single day, falling to just ~27C at night. In cities like Genova & Milan it reaches 38C and higher, even Italians find it hard to sleep. The sand on the beach is over 50C and it hurts to walk on. If I park my car in the sun then temperatures can rise to well over 42C. Once I drive around for 10 minutes the temperaure falls to 34C. Temperatures are supposed to be air temperatures 2m above ground and measured in the shade. Temperature spikes lasting just 20 minutes cannot happen for meteorological reasons. They must have a local cause – either poor shielding or an external heat source. Take a look at this interview about the futility of knee-jerk action by any single country. The only long term answer is technical innovation. My brother in Dunning is sharing your pain. I agree I don’t want to return to the LIA the Minoan Optimum on the other hand would be fine. Don’t forget jets also use reverse-thrust during landing. This heated air is not only diverted rearwards, but to both sides too. In addition, there are multiple planes taxiing beside the main runway(s), waiting to take off. In addition the turbulence generated by passing aircraft would help mix the air close to the ground and so, is more likely to lower the air temperature rather than raise it. In that one answer they are admitting that heat ‘reflected’ from the ground is the most likely cause of the spike. Hot exhaust gases reaching the station is another. If they just want mixing – then instal a fan ! Doesn’t look like Heathrow needs all this special pleading. TonyB pointed out at WUWT that Accuweather seems to just use Heathrow temperatures in the data for nearby towns, and that in Reading at least, the temperature reached only about 93F. So this isn’t useful data – apologies. Why is it that weather becomes climate in so much of the media. Why are record highs reported, but but record lows ignored. In the north Scottish highlands we have experienced the cpressureay and June on record and if things continue, it will be the coldest July too. In Orkney farmers are having to sell cattle because it has been so cold that the grass hasn’t grown. There is still snow on the hills in mid July, normally all gone in May. Further afield there is cold, with record snow falls in south Norway in early June. The last of the snow only disappeared in Boston USA this week. Sydney Australia had snow last week! This all does not imply global warming, or global cooling. It is merely fluctuations in weather, which has always happened. The media however likes hottest day stories, flood stories, big wind stories and hopefully a few deaths. It sells papers and increases viewing and so brings in more revenue. Why the BBC behave like this is a mystery unless they feel their publicly funded service has to out sensationalise the rest of the media. Understanding the drivers of climate is only clouded by sensationalism, since fear created by the media leads to demands for action and gets in the way of good objective scientific analysis. Science cannot be done to time scale and turns into politics if put under pressure. 1.30pm and the outside temperature is 13C, 10 degrees lower than this time last year. It has never snowed in Sydney. There was snow in the mountains, in the usual places. I suggest you retract that statement or do some research, it took less than a minute to find pictures of Snow in Sidney from 2014. That is not Sydney. Orange is one of the places that, in Wiki’s words, “is one of the only cities in Australia to receive regular snow, with moderate to occasionally heavy snowfalls occurring several times each winter”. It is 254 km from Sydney at an altitude of 862 m.
It does not snow in Sydney. Again, bad geography. The photos are from Katoomba and Blackheath, in the Blue Mountains at altitudes over 1000 m.
I think the 1836 claim would need closer examination. The coldest temperature ever recorded in Sydney was 2.1C, in 1932. Osborn, you are a clever guy! Everything Nick Stokes say; need to be taken with a big bag of salt – AND you must check for yourself. There are few dozen of them on the net, trying to misinform and muddy the water. Osborn, you are clever and have my admiration!!! I posted this over at Energy Matters, you won’t find the BBC or MSM reporting this stuff. Heaviest Snowfall in Peru in years kills 171,850 Alpaca. Record cold in Illinois, Iowa, Kansas, Wisconsin, Minnesota, Indiana and Michigan, records broken by as much as 10 degrees F not by 10ths of a degree like the hot temps. I forgot to mention that was all in July 2015. Are the flight arrival times GMT or BST (The Met graph is GMT)? 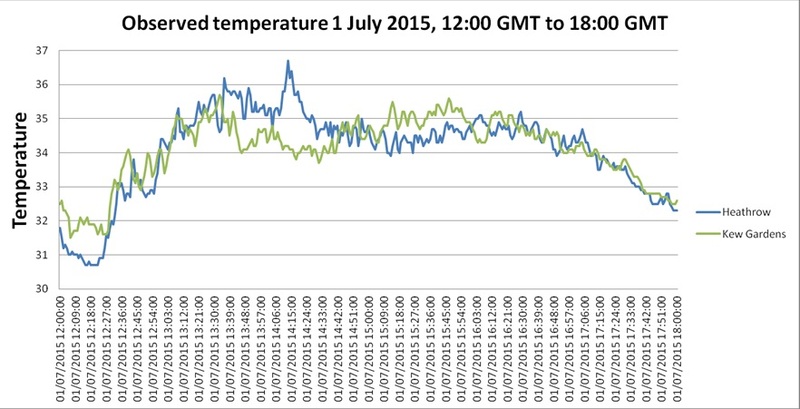 i.e the temp spike was 14.15GMT, which is 15.15 BST. I had a twitter exchange with Mark McCarthy about just this point. It is quite likely that I am an hour out so I will need to recheck the arrivals times. I am using an Ipad APP ‘Plane Finder’ while in Italy ! My theory is simple. A large aircraft exited down that exit lane with a SE wind. As it turns to accelerate so hot exhausts are blown back onto the weather station ~50m away. The SE wind also ensured the heat pulse reached the station. I now need to double check whether this is correlated in exact time. Here’s a list of articles from the 70’s predicting the next ice age along with a link to the website that listed them. * Note: A couple of the news stories are duplicates in different papers with slightly different titles, this is intentional to show that these types of stories were not isolated to a certain regional paper. Not doubting your landing information, I wondered where you found it? earlier in the week and I don’t understand all the columns but it identifies a flight number, registration number, a plane type and a runway (L or R not sure about this?). Checking I couldn’t find any A380s in the time frame, two in quick succession I don’t know whether the times are for arrival/departure from the terminal in which case the time on the runway would be several minutes before or after. @ Ben – I understand from my sources that until 7:30pm the North runway (“L” or left as a pilot would see it) was used for landings, and the South (“R”) for take-offs. From the link you provided I can see the change to runway 27 occurring between “1831” & “1833” which means times in that list are shown in GMT. This is standard aviation practice, so we would need to be looking for times in the 1300 range. I used “CTRL+F” to highlight all the “09L” entries, and as it happens, there were TWO B747-400’s in succession, at 1314 & 1315 respectively. That ought to have generated a good blast of heat! Thank you Dave that makes good sense. I’m not familiar with the world of aviation and how the log times. So three 747 landings in 4-5 minutes. As you say a large blast of heat with with a lot of A320s to keep things nicely warm. Thanks Dave and Ben ! That is a great source (even though I had to use a text editer to read it). The heat spike occured more or less exactly at 14:15 GMT. Two BA 747-400s landed within 2 minues of each other at precisely the right time. The first BA 272 from San Diego landed at 14:13 GMT and the second BA 274 from Las Vegas landed at 14:15 GMT. It is likely that such heavy aircraft would have had to exit the runway directly in-line with the Met Office station. That equates to 8 Rolls Royce Jet engines pointing directly at the station within a 2 minute period. This was then enhanced by a SE wind of 12 M/s blowing directly down the exit lane towards the station. It is inconceivable to me that the Met Office can argue that a simple break in the clouds could cause such a huge temperaure spike. The Stephensen screens are supposed to be shade the thermometers from the sun! However they have air vents to let air circulate inside ! @Clive – the “mht” file that you get from Ben Vorlich’s link above showed up (to me) as an”IE” document. Since I don’t use IE, I right clicked on the saved file and selected “Open with Palemoon” (a Firefox variant) and it opened in a normal tab, from where I was able to use “Ctrl+F” to highlight the appropriate entries. Here, as elsewhere, one senses a whiff of desperation, as Nature fails to stick to the CAGW Party Line…. Pingback: Questions raised about Met Office claims of a new high temperature record | Watts Up With That? Climate and climate change are long term, extremely complex subjects. If GHGs are causing a temperature change it will appear as the cumulative effect of many minute ripples on top of larger waves. None of them will be apparent at the time, but the effect may accumulate eventually. The Heathrow heat spike in question was obviously an anomaly, and its occurrence does not speak either for or against climate change. So much noise from what should have been an unreported anomaly. Its occurrence raises the further question of how long has that station been affected by more dilute jet wash in general? There could be substantial unrecognized effects in the historical data from that station. Why was that met station not moved long ago? Might be interesting to look at aviation history with respect to large jets, and trends in historical temperature at airports, or at Heathrow anyway. Not to mention the gradually increasing heat island effect of more asphalt, concrete, terminals and car parks on a time scale of decades. Not to mention the gradually expanding heat island of London itself, also on a timescale of decades. Remember that warming is always measured in temperature anomalies whereas temperature records are measured in degrees centigrade. That way the Urban Heat effect can simultaneously break temperature records and be proven not to effect global warming. How is that possible? The trick is to renormalise anomalies for each station to average temperature values just 20 years ago.